This post is about integrating HangFire With ASP.NET Core. HangFire is an incredibly easy way to perform fire-and-forget, delayed and recurring jobs inside ASP.NET applications. CPU and I/O intensive, long-running and short-running jobs are supported. No Windows Service / Task Scheduler required. Backed by Redis, SQL Server, SQL Azure and MSMQ. Hangfire provides a unified programming model to handle background tasks in a reliable way and run them on shared hosting, dedicated hosting or in cloud. The product I am working has a feature of adding watermark to the images uploaded by users. Right now we are using a console app, which will monitor a directory in specified intervals and apply watermark to the newly uploaded images. But using HangFire we can schedule / execute the watermark opertation as a background task, instead of polling a directory for new images. To integrate HangFire, first you need to add HangFire as a dependency in the project.json file. "Hangfire" : "1.6.8", is the package, I am using .NET Core 1.1. Now you need to modify your startup class Configure() and ConfigureServices() methods. Here is the ConfigureServices method. //Following line is only required if your jobs are failing. //The following line is also optional, if you required to monitor your jobs. Now you’re done with the Hangfire configuration. Now as part of the upload logic or action method, you can add the watermark job to background or can be scheduled to later time. Here is the code to apply watermark in a background job. If you like to schedule it for later time, like after 5 minutes, you can do that using Schedule() method. 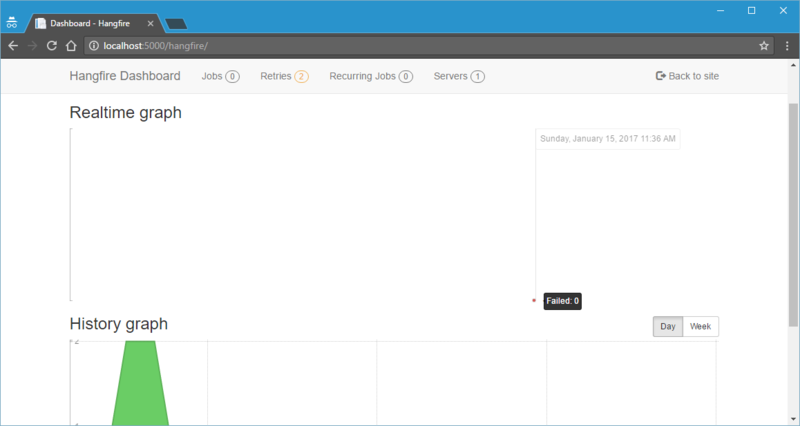 HangFire also supports Recurring jobs and Continuations jobs. Recurring jobs fire many times on the specified CRON schedule. As mentioned Hangfire Dashboard helps to monitor the tasks. By default Hangfire allows access to Dashboard pages only for local requests. In order to give appropriate rights for production use. You need to implement IDashboardAuthorizationFilter interface to configure authorization. And here the implementation of Authorization filter.